Mick Gordon is responsible for a track called “Voices of Dev”, which was made using nothing but sounds of the human voice. After watching the video, I decided to track him down and asked for an interview. 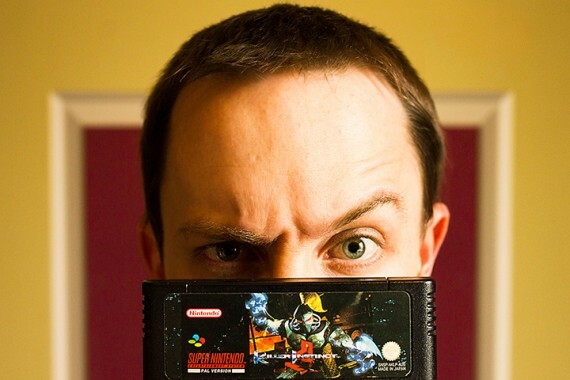 Fast forward a few months, and here we are with some interesting words from Mr Gordon himself, concerning his work scoring games like “The Last Airbender” and “Killer Instinct”, as well as trailers for “Crysis” and “Dead Space”. Hi Mick. Can you start off by telling me a bit about your music background, and how you got into the game music world? I started with the guitar when I was twelve because I wanted to play music with my dad, and advanced from there into 80s hair-rock stuff. But when I finished school, there didn’t seem to be any future in that kind of stuff, since no-one cares how fast you can play a guitar solo anymore. So things changed, and with that came the ability to make electronic music on your own in the early 2000′s, and it occurred to me that I could write music for a living, instead of trying to play guitar solos. So I started looking into the things that I could write music for. Everyone thinks they’re going to write music for pop stars or film, but that can be really difficult to get into. There were around 40 companies making video games where I lived in Australia at that time, but there were very few people doing game music. Companies were outsourcing that work overseas, to the States and Europe. That was an open market staring me in the face, so I set up my own home studio and started contacting game companies. To my luck, I started getting work, and it progressed from there. You do one game, and people from there move to another studio, and they hire you again, etc. It’s been a progression of that over the past ten years. All my stuff nowadays is scoring work. I do some film stuff as well, and some trailers too. What were some of those companies that initially hired you in your early days? Was it hard for you to get work from them? When you look back on things, you think it’s hard at the time, because you send one email, and when no-one answers you think, “This is really hard…“. But pretty much everything is based on luck. It’s the old “right time, right place” factor; there has to be someone at that studio who’s willing to see your email at the appropriate time of the day, who needs music at that moment, and you fit that bill. There are a lot of chaotic factors that you have no control over. I started contacting some smaller studios, and did music for smaller games. Eventually I got into contact with THQ, and did some Nickelodeon games. Then we did some Marvel games and “The Last Airbender”. I also did some stuff at EA, with games like Need For Speed, and trailers for “Chrysis“, “Dead Space“, “Medal Of Honor“, etc. The stuff I’ve done recently is for Microsoft. So my work has progressed a lot, but there was a lot of luck involved. But luck assumes that you have everything else sorted out. If you have your skills, talk to the right people, write music, and know how to deal with money, then the rest is luck. That’s the one thing we have no control over. Why did you decide to go the freelance route? Didn’t you have a fixed position at Pandemic Studios at the time? Working at Pandemic Studios was great, because I was in amongst all the creatives. They designed the game, drew the artwork, designed the code, handled the programming, etc. I still apply the lessons I learned at that studio, but when you’re a part of the in-house staff, you could end up working on the same project for three to five years. As a freelancer, you can work on three to five projects in a one year, which was very attractive to me, so I switched. What are the variables that make freelancing a risky career, as opposed to being in-house staff? I think the biggest thing most people struggle with is that freelancing doesn’t involve writing music for yourself; you’re writing to a brief that someone else has decided fits the project they’re developing. It’s big difference. Let’s say you wanted to make an EP based on the life of chickens. You can easily make chicken song #1 and #2, and release your chicken-concept EP anytime you want. But as a contracted freelancer, the company comes to you and say, “We want you to design music based on tonka-toys “. So now you have to design music around the concept of kids playing with tonka toys, and that may be a creative idea that never occurred to you before, and it can be a big struggle for some people. Also, we know that people come up with creative accidents. You might be fooling around with a new plugin, and stumble across something cool. But when you’re writing music as a freelancer, you can’t do that. If your fascinating sound doesn’t fit the brief or the reason you were hired, it will get thrown aside. As far as skill set goes, writing music to a brief can only be learned by writing music to a brief. There’s no book that you can read to learn that; it comes through trial-and-error. I’ve been doing this for over ten years now, and even I struggle with it. I get a brief and go, “Gosh, I can’t remember how to do this…“. So yeah, it’s a skill you have to learn through experience. Would you think of yourself more as a sound designer or composer? It’s weird. I don’t really slap descriptions or genres onto things. When I hear the word “composer”, I picture some old guy like Mozart with crazy hair, bending over a piano. Although I’m sure Mozart could do with FL Studio or Ableton would be mind-blowing. He was an absolute pioneers for the tools that he was using at the time. But I would probably describe myself as being a musical sound designer; I design sounds with a musical intention. Some inexperienced producers seem to think that music-making can be reduced to letting the samples and plugins do most of the work. What would you say are the skills required to do what you do? It really depends. Sometimes you get a game that does require the use of music with highly compressed samples. A racing game is a good example. Overly compressed samples are exactly what will cut through the engine sounds. So each project is different from the next. Luckily, I’m getting to the stage where companies approach me for the skill set that I have. When you start out, you have to be a chameleon of sorts. People ask you for a dance track, an RnB track and an orchestral track all at once. So you learn quickly how to produce different types of music. But there’s just so much to learn. 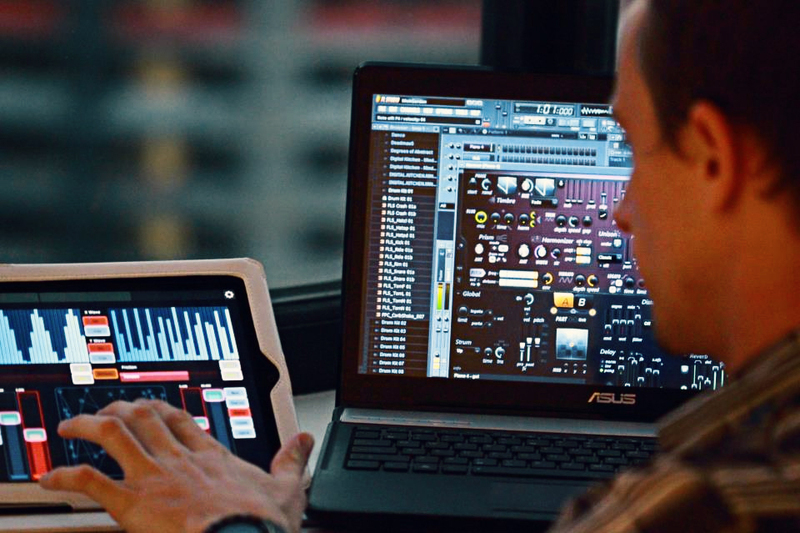 Even if you know how to make beats, that’s just one tiny element of producing music for games. You need to write scores that reflect the game and its characters. So this job combines a number of different skills, and producing music is only one of them. Ultimately, we also need to put the music into the game, and that’s a skill within itself – it’s not just playing MP3s. Looking at your back-catalog of work, there does seem to be a lot of demand for your services. Are you able to keep up with the workload? Sometimes. It comes down to good time management, even though I say “yes” to many things and it gets me into trouble down the line. But if you do something over and over, you get better at it. I mentioned before that composers have to know how to write music to a brief. They also have to know how to write music on a deadline; you might have only have half a day to finish a track that would have normally taken you six months. So you have to learn how to finish music projects quickly and move on because you always have a deadline to turn in your work by. Most of the time, companies can move that deadline; they can sometimes shift it by a month if they have to. But when a new console is about to be released, and your game is part of the launch titles, you absolutely have to finish everything on time. Microsoft isn’t going to delay the release of the Xbox One for the sake of my music on “Killer Instinct“. Let’s talk about “Voices Of Dev”. What inspired that, and what response did you see from the public upon its release? I’d just done five projects at once, and was completely burnt out creatively, and wanted to do something different. So the idea for “Voices Of Dev” came from Diego Stocco and the interesting videos that he was making. He makes music out of things like sand, trees and laundry machines. A few years ago, I had done a challenge at the Game Developers Conference, which was to make music using only voice samples. It was really interesting, and I wanted to expand on that. So for “Voices of Dev”, the challenges was to make a similar track out of only voices, but to not make it obvious that voices had been used; you shouldn’t be able to tell that the kick, snare or synth sounds were made out of voices. So I went back to GDC, stuck microphones in front of people, and recorded whatever they said. It was really tricky. Making a punchy kick is hard, and making it using only voices is even harder. Then I used nothing but the sounds to make “Voices of Dev”; it took me five weeks. There seems to be a belief among many that the entertainment industry is the place to be if you want to avoid a nine-to-five job. How do you, as a music professional, balance the desire to have fun with making money? At the end of the day, you have to treat it as a job, which is what it is essentially, even if it’s something that you have fun with. I could say to the developers. “I’m not doing this song in half a day. I want to take six months on it “, but I wouldn’t get paid. So you have to very much appeal to the creative restrictions of whoever is paying you. I find that a lot of people email me saying, “Oh, you have a dream job. You get paid to write music. I want to do that to. I don’t want to work. I just want to write music all day “. What they mean by that isn’t, “I want to get paid to write music “. They’re really saying “I don’t want to work “. This is really a job that you have to work at. Ask anyone who’s involved in any kind of creative profession; they work way more at their profession than they would at a day job. The hours I put in at the studio are way beyond what I would have at a nine-to-five job. These can be eighteen-hour work days, where you sleep under the desk to get things done. If you can accept that, then you can combine fun and work quite easily. What have been some of the negative things you’ve experienced that made you feel like your music work was a full-time job? I’m sure it’s nothing compared what others would face in their day jobs. I certainly don’t have to drive for an hour to an office and get shouted at by my boss that I don’t like, and then drive home for another hour to get screamed at by someone else. I don’t face that. But some negatives might be that I spend 24 hours working on some music, which gets rejected, and then I spend another 24 hours work on it, and it gets rejected again, so it’s another 24 hours of work. So now I’ve been awake for three days and things don’t make sense anymore, and all your MIDI notes start to look like ants across the screen. That happens with pretty much every game (laughs). What are the criteria for you to accept a game project to score? The biggest factor is scheduling. If you can’t fit it in, it’s best to say “no” to that. Otherwise, if you say “yes” (which I tend to do…), you may not be able to do a good job, due to time constraints, so your employers won’t receive the quality of music they’re paying for. Letting people down is something you don’t want to do. Game and film composers play a part in the electronic music scene of today, since they use similar tools. But composers aren’t getting as much media attention as the DJs. Does the lack of fame for your work bother you? No, not at all. We all wake up thankful that we get to do this for a living. There may be a lot of people out there that are making money from electronic music, but there are way more who make absolutely nothing. Writing music for video games as a living is a nice way to create a stable income from making music. If you’re doing this for fame, then you’re doing it for the wrong reasons. I’d be writing music whether I’d be getting paid or not. It’s just this wonderful situation of luck that enables me to get paid. I’d hate to be under media scrutiny and have millions of followers who tweet me pictures of themselves all the time. I don’t know how you would escape that kind of stuff to find a creative space. A big DJ who earns millions of dollars year could have so many people around him telling him that he’s great. How are you going to get any objective feedback on your music? I think it’s all about the art in the end. The popularity for electronic music we’re seeing has many people jumping into the genre for the such reasons though. What are your thoughts on that? Let’s say a young person who just wants to be famous grabs some samples, throws them in a sequencer, compresses the heck out of it, and releases it as his first track. That may be the start of his career. But give him ten years, and he might be a completely different person, writing music for some amazing project. If he never had that initial desire of wanting to be famous, he may never have reached that point. So it’s not about where people start, but rather where they end up. If you’ve never made electronic music before, and you see these DJs making huge amounts of money, you’re going to think that’s what a music career is all about, and that can get you started. You may not know about samples, scoring, scales or music theory, but you learn all that as you go along. When I was young, I wanted be a hair metal dude with long, spiky hair and play the guitar really fast. As much as that might seem silly, had I not gone down that road, I wouldn’t be here talking to you. Would you say that the skills necessary to make music for video games overlap with the ones that EDM producers use to make their music? Yeah, absolutely. The music I make for video game developers is different every time. Sometimes they say, “We want your music to sound like this huge DJ’s”. But since they can’t afford to pay the DJ, they come to me (laughs). Music is music though. If we’re talking about big DJs, Skrillex had a whole career before becoming a DJ, playing in bands and stuff. So just because DJs are releasing electronic music, it doesn’t mean that it’s all they do. It’s just what they’re doing at that particular time. Under different circumstances, they might have been doing something completely different. Also, what’s electronic music these days? Every piece of music is going to have electronic elements anyways. Very rarely does music go from somebody sitting in a studio playing an acoustic guitar into a valve microphone, to a valve pre-amp, onto tape, and then being pressed to vinyl. All the big film and game scores are hybrid creations, and there’s a lot of digital stuff that goes into make it sound as big as it does. Do you think the video game music industry gets enough recognition by today’s media? Let’s look at Austin Wintory, who made music for the games “Journey“. He got nominated for a Grammy, alongside some amazing composers. Video game composers getting nominated for Grammy awards is as far as you can go, right? Sure, they’re not making reality TV shows about us on MTV, but we probably don’t want that anyway, right? You have a point there. What was it like to work on the soundtrack for “The Last Airbender” game? I heard that THQ didn’t give you much reference material for it. That’s true. They said “We want you to write music for The Last Airbender. There’s a movie coming out at the same time, and we want the video game score to sound like the movie’s ”. I said, “Cool. Can you send me the movie’s music? “. And they said, “No, we can’t “ (laughs). So I had to guess what James Newton Howard was going to do for the film, and do the same for the game. But I’m a huge fan of his past scores, so I was familiar with his work already. It’s very melodic and almost pop-like in chord choices. So I analyzed that, and imagined how he might wrap that around the Avatar world. It was a very quick project. I did the entire game in a month, and produced two hours of music. We recorded all sorts of wonderful instruments that I’d brought over from overseas, like wooden flutes and strings. I was a lot of fun. Why didn’t THQ just give you the film music? I think due it was due to timelines and scheduling, and the music for the film hadn’t been completed. Also, there’s always the worry of leaks with these kinds of projects. There’s a concern if material gets sent around to different places a leak might occur. But in this case, I think it had more to do with scheduling. You made the music for the 2013 reboot of “Killer Instinct” on the Xbox One. What was that like? Well, the original “Killer Instinct” blew me away as a kid. I grew up in a very small Australian town called Capella. It was a one-street town with not much to do. It only had the “three P’s”: a post office, police station and a pub (laughs). But in the back of the pub, there was an arcade machine with “Killer Instinct” on it. As a kid in the 90s, it just blew me away. I spent hours playing it, and the music from the game is still some of my favorites from any game. Fast forward seventeen years later, and I’m presented with the opportunity to write music for the return to the series. That’s what I’ve been working on for about a year. It was a huge project, since each character has it’s own theme, and each theme is completely different. So it goes from ethnic, Tibetan stuff to Native American flutes, to heavy metal, to dance stuff. It’s a real creative journey. Since I was given a year to work on the project, we’ve been able to do a lot more than if we only had a month. In the original “Killer Instinct”, each character’s theme was about a minute long. In the new “Killer Instinct”, the character’s themes are about thirteen minutes long, so the music is huge. Also, every single match that players play will feature slightly different music. “Orchid’s Theme”, for example, is more of a dance track with verses and choruses. We did about 50 different verse possibilities that players can receive each time they play. What did the process of all that work look like? I was the main person working on it, which was been a bit stressful at times, though we got through it eventually. Because of the time needed to create the dynamic music system that changes the music, it took seven months to compose the first character theme. But the second theme was made in twelve days, so we were able to whittle it down considerably. I worked closely with Jean–Edouard Miclot from Double Helix Games to work out the music system. What’s it like to be working with these different companies like Marvel, EA and THQ? The similar things are the ways that you conduct business. Essentially, they have a game that needs music and so they send you a list of what they’d like. You develop the music and send it back. That largely remains the same. The creative decisions, however, depend on your employers, and everyone works different. Jean-Edouard Miclot from Double Helix is an incredible sound designer who can make alien sound effects from frozen jeans that he puts in the freezer. He made vocalizations for game characters from sliding his fingers on glass, or would make footstep steps by recording slamming doors. So when you’re working with someone like that, you’re pushed to go even further. So it all comes down to the individuals you work with at those companies. Do you feel that the level of bureaucracy varies from company to company, in terms of the creative freedom they give you? Absolutely. You have to earn creative freedom. With a video game, you have a deadline by which time the game simply has to come out above all else. So it’s a huge thing to ask a big company for responsibility of creative decisions. If things go wrong, and the music you deliver isn’t good enough, it becomes a giant problem for them. So you really have to earn that responsibility, and that takes years. It’s still not a decision that I’m 100% comfortable making. I’d have to send it through several different people, who would ask me what I’d prefer. I find that this is the best way to arrive at an outcome that everyone enjoys. Also, it’s very wrong of an individual to think that they can have the greatest creative say-so and still come up with a result that works for everybody. At the end of the day, the video game is being created for a market. So while I might think, “This piece of music should just be a solid square wave for four minutes“, someone else might say, “Er, I don’t think your average player will get why you’re putting that there…“. Video games is a big multi-billion dollar business, so there are lots of procedures that come with that. But that’s just how it goes. From “Voices of Dev”, I gathered that you use FL Studio. Why that DAW? FL Studio is something I started using a few years ago. I have a hybrid studio setup of digital and analog, hooked up to a dual PC setup which runs a whole bunch of ins and outputs to my gear. That runs back into the computer through Pro Tools or Adobe Audition, depending on which I feel like working on. Pro Tools can take forever to load up though. For creating music and sounds, I use FL Studio. I find that Pro Tools and Adobe Audition does recording, mixing and mastering really well, but FL is great for sound design and layering stuff up. For MIDI controllers, my favorite is the Keith McMillen QuNeo. In two seconds, I can start up FL Studio, open a synth, tap a couple of times on the QuNeo and have every parameter on the synth mapped out to it; it’s great and simple. I use a lot of the Waves stuff, which has a lot of good plugins for mixing and mastering. I love Ohm Force stuff like Ohm Boyz and Ohmicide. Soundtoy’s stuff is fantastic too. Everyone uses Decapitator of course, but things like Radiator are cool too. I did bunch of trailers for “Battlefield 4“, and all the distortions in that came from Decapitator and Little Radiator. FL Studio also has awesome native plugins. Basic things like limiters and compressor are good to use, and synths like Harmor and Harmless sound huge too. Aside from that, I use a lot of outboard gear for processing. Compressors, EQ’s, different pre-amps, distortion units, etc. I also run stuff through guitar pedals and into phasers and things like that. It’s not about the plugins though, but rather how you use them. There’s no magical plugin that makes stuff sound good; it’s only about what you use it for. And whilst you can pirate a lot of software, a good point to bring up is that if you illegally download a synth, you’ll browse through the presets and think, “I might use this one, or maybe that one, bla bla “. But if you spend the money and buy that synth, you’ll learn every single aspect of it. If a person who prefers to download plugins for free wants a limiter, he’s likely to download ten of them. Well, limiters all do the same things essentially. Any good limiter does what the other ones do, so you’d be better off buying one and learning about how it works. Good point there. Do you do your own mastering? Or do the game companies take care of that? It depends on the project. If it’s a big budget project, the company will take care of it in-house, and you just send them the stems. The reason they do that is so every piece of music sounds the same. Music mastered by one person sounds different than music mastered by another person. So if different composers worked on a score, the company will have one person do the mastering for all of it. On other projects, I do all mixing and mastering myself. Is there any mixing advice you could share? Sure. Pan sounds left, right or center. Don’t screw with 80% right or 20% left. If you can make it sound good with dead right and left panning, you don’t need anything else. Secondly, the mix is complete when you can take nothing else away; if you have 20 kicks in your track, you could probably lose a few. Finally, mix at a low volume. So many people cram up their volume. If you can make you mix sound huge at a low volume, then when you turn the volume up, it’ll become more dynamic. I see a lot of people trying to fix things at the mastering stage, but that’s not the goal of mastering. The goal is to even things out and make sure everything sounds the same. So if you’re EQing the master, and have to boost or cut by more than 2db, then there’s a problem with the mix somewhere. Sometimes people send me tracks to mix, and when I take their mastering plugins off, the track looks like a fish skeleton (laughs). I’m like, “What are you doing? “. On a final note, what kind of advice can you give for someone who wants to get into video game composition? The most important thing is to have an open mind and be open to any sort of opportunity that comes up. If you have your mind set on an ideal career path, you’ll ignore the opportunities that might take you down a different pathway. Whilst this might work for one person, it may not work for someone else. Every one I know that writes music for video games came into it through a different series of events, so there’s no one way to get into it. The second things is learn as much as you can. Learn crazy things, and get into different genres of music. Your joy should be the love of music, not the love of certain types of music, but all music. The love of air pressure making sound in your ears. If you love that, it’ll be easier to get work. The third thing is to have fun. If you’re not having fun with what you’re doing, then quit. Some people struggle with making music for a living, and just go crazy. So it’s important to remember that it’s a fun job.